I have a ponytail palm that I have had for years. It is now close to 8 feet tall and has babies shooting out from the stalk. I would love to cut off some of the main trunk so I can continue to keep it. I put it outside during the summer and it just thrives. I am afraid of killing it, which would break my heart, but it is outgrowing my house. Do you have any suggestions? I have to figure something out soon, as it is getting too cold to leave outside. 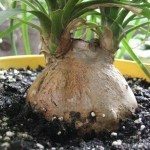 Here is an article on pruning ponytail palms that will give you more insight - it will explain why cutting the trunk is not recommended.